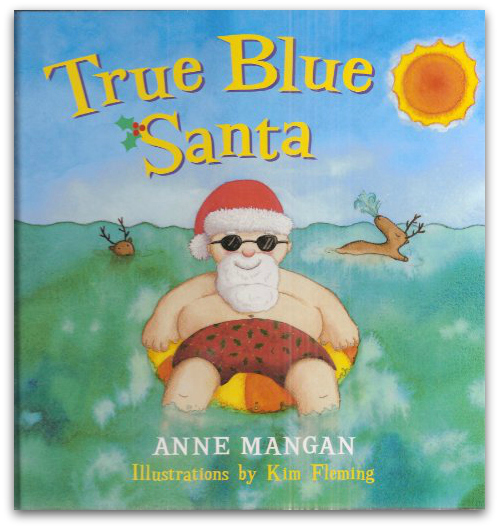 Pictures of snow and robins at Christmas in Australia are just too topsy turvy for me, to rectify it True Blue Santa will definitely be coming out of my book corner this year. It will ensure that we’ll be revelling in all things Aussie this Christmas! Jack and Hannah do what is really needed, give the Aussie Christmas a true makeover and turn it in to something that Australian children (and adults) can all identify with. Of course, this is not possible with out a little magical help from the man himself. Santa Claus is the first to get a makeover – I mean, really, in that big red outfit he’d be passing out – even in Melbourne’s weather! Cue thongs and boardies for the bearded one. The solution to the weather “Being too hot for the reindeer” made my son laugh out loud. Kim Fleming provides gorgeously comic illustrations of the reindeer lazing by the pool and taking a dip. The idea of teaching the emus to fly the sleigh is inspired – the ‘P’ plate on the back, and the sparkling red noses are great touches to the illustrations. Anne Mangan captures Aussie culture with touches such as cricket in the back yard and the Christmas dinner .. “everyone bought a plate.” The multi cultural modern Australia is reflected in the eclectic food, supported by mouth watering illustrations, and the Aboriginal history is acknowledged through references to the Dreamtime. With four line rhyming stanzas providing pace and rhythm this is a perfect reader for the younger ones. I loved reading this book, my only difficulty has come in trying to ensure my review doesn’t become too long!